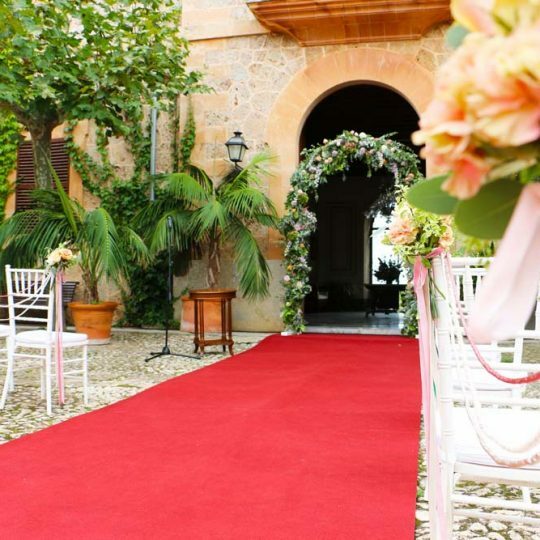 Son Mir is one of the most distinguished and renown estates in Majorca. Dating from the 17th century, even appearing in the book of the Archduke Ludwig Salvator as the 10th most important farm and cattle estate in Majorca, with a marked historical tradition within the estates in the island. Nowadays, it is under the management of Pep Riera, and this estate is mainly purposed for the celebration of all kind of events, as well as the production of a high quality extra virgin olive oil. The collaboration kept by the estate of Son Mir with Marc Fosh Catering, which is its exclusive catering, goes beyond the professional frame. “I already knew Fabrizio Giunta, the catering coordinator, for a long time, and considering his philosophy and the way he works, we contacted them to work together exclusively, being confident about the good results we would obtain from this collaboration“, explains Mr. Riera. According to Pep Riera, “the clients fall in love with the products they offer. We looked for something in accordance with our estate, and we found it with them. They offer a handmade and Mediterranean product, a traditional international cooking, just with an innovative and modern touch which makes it unique”. Undoubtedly, the duo formed by the estate of Son Mir and Marc Fosh Catering makes any celebration leave a pleasant memory on the attendees, and this joint collaboration marks the difference from other places reserved for events, as much for the beauty and convenience of the environment as for the excellent quality of the menu and its service.